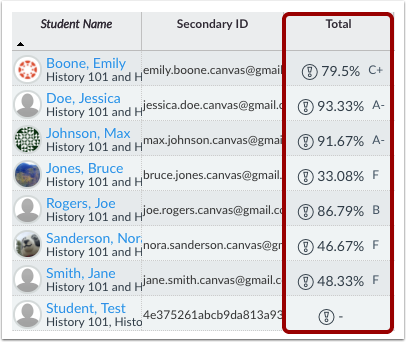 You can move the Total column to the front of the Gradebook to quickly see an overview of student progress in your course. Moving the Total column to the front is persistent according to browser. It will stay in front until you switch browsers or move it back to the end. Click the blue toggle arrow and select the Move to front menu option. View the Total column in front of the Gradebook. You can move the Total column back to the end of the Gradebook at anytime by clicking the blue toggle arrow in the Total column and selecting Move to end. Previous Topic:How do I sort columns in the Gradebook? 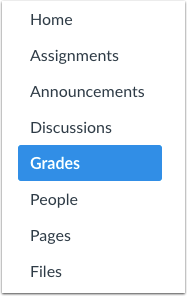 Next Topic:How do I use the Notes column in the Gradebook? Table of Contents > Grades > How do I move the Total column in the Gradebook?